"Discover How To Easily Secure Affiliate Links And Beef Up Conversions With This Revolutionary Software." "Finally! No scripts or software to install! Just a couple of clicks and all my links are protected. It just doesn't get any better or easier. Thank you for providing this simple, much needed service!" If you want to receive every commission dollar you deserve from your promotions, then protect them with Click Bank Guard. Your earnings from other Affiliate programs? Money that is rightfully yours? Don't think it happens? Think again! "I'm impressed. Not only will Click Bank Guard get rid of the server side redirect that most super affiliates use, it preserves the commission that some folk would have readily scooped for themselves. The fact that it gives the added benefit of improved search engine positioning for affiliate links is just icing on the cake. I also found it very easy to use. Type in the affiliate link I want to protect and click the submit button... It doesn't get any simpler than that. I get an encoded page where no one can steal the commission. But the real beauty is, the encoded page and the product page - I would have linked to - look the same. No one can tell it's an affiliate link. Most protection software out there is geared towards the seller, relying on them to protect the commission for the affiliates. Your software comes from the angle of protecting the little guy, the affiliate. Thanks again for introducing me to your software." Most companies don't protect their affiliates. As Michael pointed out, most protection software relies on the seller to protect his affiliates, and unfortunately most of them don't go to the trouble. But now, Click Bank Guard enables affiliates to protect themselves! It will protect any affiliate link. Most affiliate managers are not even aware of how easy it is to bypass their referring affiliate. ClickBank ® is probably one of the largest affiliate managers on the Internet and provides an excellent service at an unbeatable price. Part of the appeal of ClickBank ® is that it is so easy to set up an affiliate program and so simple to become an affiliate. In our opinion, ClickBank ® is the best affiliate solution for most companies. This ease of use does not come without a price. It is easy to change most affiliate links so that the affiliate who told you about the program doesn't get the commission, but you do. Are you beginning to see why you must have this program? Here's how: Say you hear about a new ebook and click on the link; say it's https://www.tradebit.com You like what the book has to offer and decide to buy it. But why should you pay full price when you don't have to? If you are signed up with ClickBank ®, all you have to do is copy the address from your browser. Paste it into Notepad. Change the ClickBank ® ID, (in this case gra27, between the question mark and the slash), to your own. Then copy the new URL. Paste it into your browser and voila; the affiliate loses his commission again and you get the book for as little as half price. Believe me, it takes longer to describe than it does to do it. The fact is, it is being done, so you need to protect yourself. What can be done about it though? Is there anything ClickBank ® can do? I don't think so. It would require a complete overhaul of the way their program works. That's not going to happen. How about the Affiliate Managers? Can they do something? Yes. But without some incentive, most of them never will. Yes, now there is an easy solution. Now you can protect yourself too with our revolutionary method. "Take a bow Ellery, your Click Bank Guard is just a W I Z A R D system!! No longer do I have to use an affiliate ID code string that ends somewhere in the next country... AND I get to keep ALL the money that I work so hard to make; no more thieving. AND... it's so simple that even a techno-illiterate like myself can use it. Thanks Pal. Ellery for President, I say :-) "
Do you ever wonder why you are not making as much money as others on the Internet? Are you aware of how many affiliate commissions do not go to the affiliate who earned them? Well now you can make sure you get credit for every dollar you earn from affiliate programs with Click Bank Guard. Bullet proof your affiliate links against piracy. Make certain you receive all your hard earned commissions. Never worry about your affiliate link being bypassed again. Often prospects you have referred remove the excess affiliate code to shorten the url. Sometimes they even substitute their own code for yours, and they receive the commission. But now you can prevent that. By using Click Bank Guard your referrals will often not even be aware that you are using an affiliate link. More sales will be the result. No third party server involved. Put it on your own website. No worries about someone elses server being down and affecting your sales. No additional monthly hosting costs. You can even use a free hosting account. Search Engine Friendly - Your new url will not have a question mark that prevents it from being indexed by search engines. Plus, you can include your own meta tag title, description, and keywords to not only get listed but to get a top ranking. Now you can make every long, unappealing affiliate or web site link become a short, easy to remember, search engine friendly url. Your visitors are 3 times more likely to click on a short link and buy from you. Unlimited ClickBank ® URLs - You can set up an unlimited number of ClickBank ® (or any other affiliate programs') links. A one time payment. No additional costs. P.S. 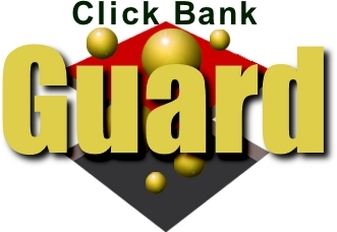 Click Bank Guard was designed from the ground up to be the most effective solution available for protecting your ClickBank ® and other affiliate program links. It does not just prevent others from receiving commissions that should be yours, it makes sure you get the credit for them.